Work is a central aspect of human life in every culture and every society. In certain societies work may be a means by which individuals define themselves and/or maintain their quality of life. However, as a whole, work is the essential means by which we all attain our basic needs such as food and water. In our modern society, persons with disability face a society in which jobs and education are not as easily accessible or attainable. Disability often complicates the delicate interrelationships between people and work. It may affect work productivity, relationships with coworkers, and relationships at home. 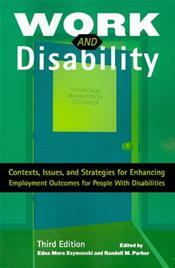 This third edition covers the latest in legislative background and other contextual matters regarding employment of people with disabilities; vocational theories and research related to disability; counseling interventions, multicultural issues, vocational assessment, labor market information, and accommodation of people with disabilities in the workplace; job placement and job development; outreach through business consultation; and supported employment for individuals with developmental disabilities. For Under-Grads, graduates, educators, researches, and rehabilitation and vocational counselors assisting people with disabilities.